PROSTRATIONS and humble salutations to Lord Subramanya, the Supreme Being, who is the ruler of this universe, who is the indweller of our hearts, who is the second son of Lord Siva, who is the beloved of Valli and Deivayanai, who bestows boons easily on His devotees, who is the embodiment of power, wisdom, love and bliss. Indra, the chief of the gods, thereupon requested Cupid to go with his wife, Rati, and his companion Vasanta (the season of spring), to Mount Kailas, the abode of Siva. Cupid carried out the instruction at once, for it was already springtime. Standing behind a tree, Cupid shot his arrow of passion towards Siva, whilst Parvati was placing some flowers in His hands. The moment their hands met, Siva experienced a distracting feeling. He wondered what it was that disturbed His Yoga. He looked around and saw Cupid crouching behind the tree. The Lord opened His “third eye”, the inner eye of intuition, and Cupid was burnt to ashes by the fire that emanated from it. That is why the God of Love is also called Ananga, which means “bodiless”. After burning Cupid, the Lord ascertained by His Yogic vision that the birth of Lord Subramanya was absolutely necessary to destroy the powerful Taraka. Siva’s seed was thrown into the fire which, unable to retain it, threw it into the Ganges, which in turn threw it into a reed forest. This is where Lord Subramanya was born; hence, He is called Saravanabhava—“born in a reed-forest”. He became the leader of the celestial hosts and the destroyer of Taraka as Brahma had ordained. Lord Subramanya is an incarnation of Lord Siva. All incarnations are manifestations of the one Supreme Lord. Lord Subramanya and Lord Krishna are one. Lord Krishna says in the Gita: “….of army generals, I am Skanda”. The Lord manifests Himself from time to time in various names and forms, for the sake of establishing righteousness and subduing the wicked. Lord Subramanya is a ray born of the Consciousness of Lord Siva. Valli and Deivayanai are His two wives. They represent the power of action and the power of knowledge respectively. He is the easily accessible Godhead in this dark age of ignorance and godlessness. In this He is no different from Hanuman. 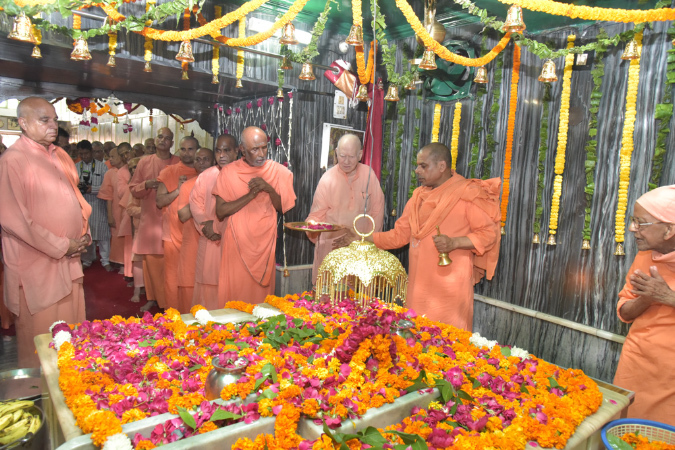 He gives material and spiritual prosperity and success in every undertaking of His devotees, even if they show a little devotion to Him. He is worshipped with great devotion in South India. Lord Subramanya’s other names are Guha, Muruga, Kumaresa, Kartikeya, Shanmukha, and Velayudhan. In His picture, Lord Subramanya holds a spear in His hand, just as Lord Shiva holds the trident. This is an emblem of power. It indicates that He is the Ruler of the universe. His vehicle is the peacock. He rides on it. This signifies that He has conquered pride, egoism and vanity. There is a cobra under His feet, which indicates that He is absolutely fearless, immortal and wise. Valli is on His one side, Deivayanai on the other. Sometimes He stands alone with His spear. In this pose He is known as Velayudhan; this is His Nirguna aspect, which is free from the illusory power of Nature. The six heads represent the six rays or attributes, namely, wisdom, dispassion, strength, fame, wealth and divine powers. They indicate that He is the source of the four Vedas, the Vedangas and the six schools of philosophy. They also indicate His control over the five organs of knowledge as well as the mind. They denote that He is the Supreme Being with thousands of heads and hands. That His head in turned in all directions signifies He is all-pervading. They indicate that He can multiply and assume forms at His will. There are big temples of Lord Subramanya at Tiruchendur, in Udipi, Palani Hills, in Ceylon and Tiruparankundrum. The Lord spent His childhood days in Tiruchendur and took Mahasamadhi at Kathirgamam. If anyone goes to Kathirgamam with faith, devotion and piety, and stay in the temple there for two or three days, the Lord Himself grants His vision to the devotee. The devotee is filled with rich spiritual experiences. 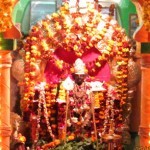 A big festival is held in the temple every year on Skanda Sashti. Thousands of people visit the place. “Mountains” of camphor are burnt on this occasion. Skanda Sashti falls in November. It is the day on which Lord Subramanya defeated the demon Taraka. Great festivals are held on this day with great pomp and grandeur. 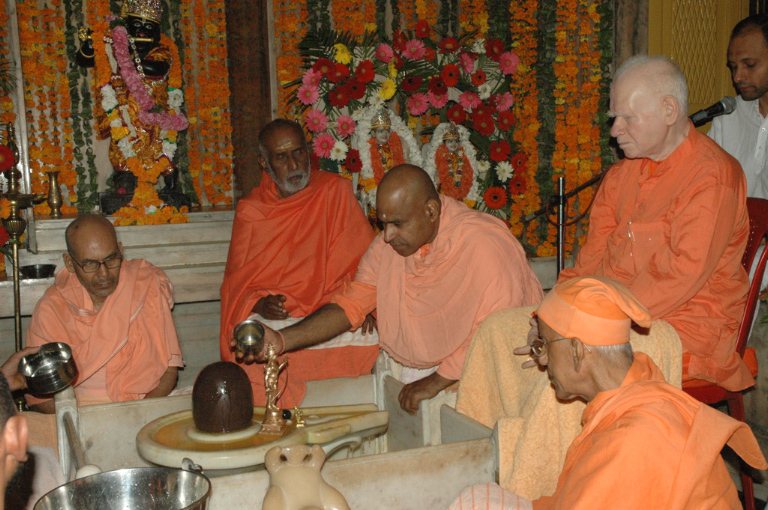 Devotees also do Bhajan and Kirtan on a grand scale. Thousands are fed sumptuously. Many incurable diseases are cured if one visits Palani and worships the Lord there. In South India, the Lord Subramanya’s Lilas are dramatized on the stage. In addition to the Skanda Sashti, devotees of Lord Subramanya observe weekly and monthly days in His honour. Every Friday, or the Kartigai Nakshatram day every month, or the sixth day of the bright fortnight,—all these are sacred days for His devotees. The sixth day of the month of Tulam (October-November) is the most auspicious of them all. This is the Skanda Sashti day. 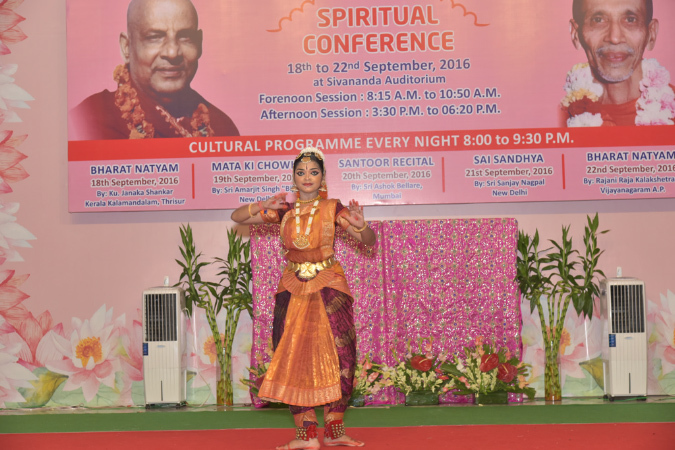 In many places the festival commences six days prior to the Sashti itself and concludes on the day of the Sashti. 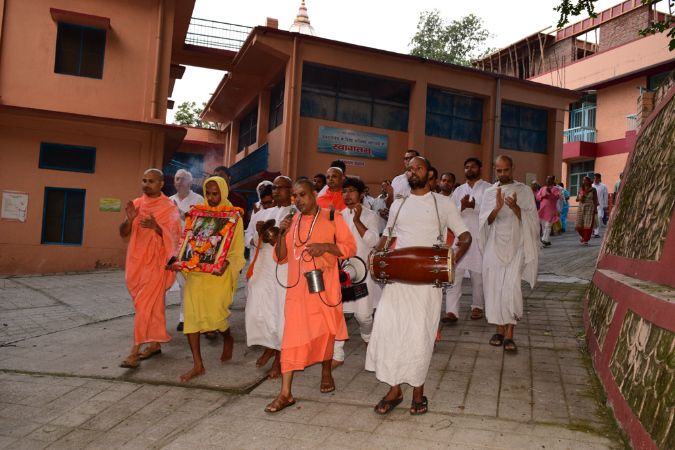 During these days, devotees recite various inspiring hymns and read stories connected with Lord Subramanya. They worship the Lord and take Kavadi (see below). 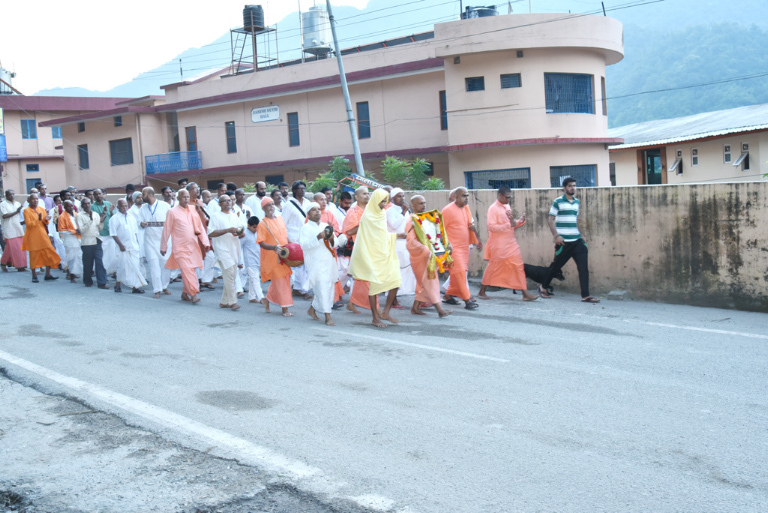 They go on pilgrimage to the various Subramanya shrines. The famous Nakkerar has composed the Tirumurukatrupadai in His praise. He who studies this famous work daily with devotion and faith, gets certain success in life as well as peace and prosperity. The Tiruppugal is another well-known book in Tamil, which contains the inspiring devotional songs of Arunagirinathar in praise of Lord Subramanya. The Kavadichindu songs are also in praise of the Lord. The Skanda Sashti Kavacham is another famous hymn in praise of Lord Subramanya and is sung particularly on festive occasions. The Kavadi Festival. Perhaps the most potent propitiatory rite that a devotee of Shanmukha undertakes to perform is what is known as the Kavadi. The benefits that the devotee gains from offering a Kavadi to the Lord are a millionfold greater than the little pain that he inflicts upon himself. Generally, people take a vow to offer the Lord a Kavadi for the sake of tiding over a great calamity. Though this might, on the face of it, appear a little mercenary, a moment’s reflection will reveal that it contains in it the seed of supreme love of God. The worldly object is achieved, no doubt, and the devotee takes the Kavadi; but after the ceremony he gets so God-intoxicated that his inner spiritual being gets awakened. This is also a method that ultimately leads to the supreme state of devotion. Kavadi: The Kavadi has various shapes and sizes, from the simple shape of a hawker’s storehouse (a wooden stick with two baskets at each end, slung across the shoulder) to the costly palanquin structure, profusely flower-bedecked and decoratively interwoven with peacock feathers. In all cases the Kavadi has a good many brass bells adorning it and announcing it as the Kavadi-bearer draws it along. As the Kavadi-bearer very often observes silence, the bells are the only eloquent signs of a Kavadi procession. Now, the two baskets hanging at each end of the Kavadi contain rice, milk or other articles that the devotee has vowed to offer the Lord. 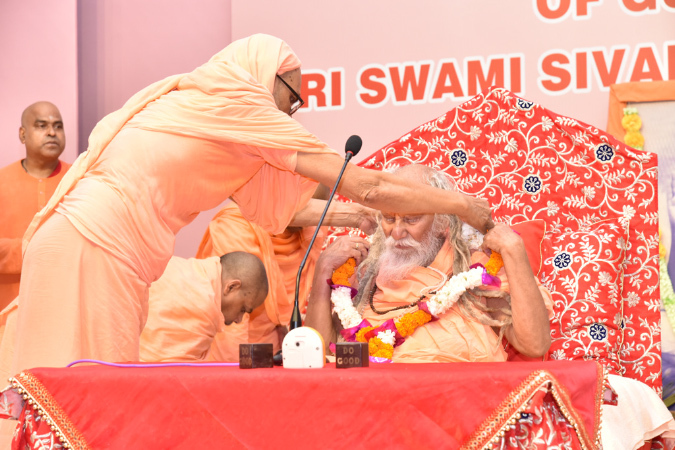 The more devout among them, and especially those who do it as a Sadhana, collect these articles by begging. They travel on foot from village to village, and beg from door to door. The villagers offer their articles directly into the basket of the Kavadi. The Kavadi-bearer continues begging until the baskets are full or the avowed quantity is reached, and then offers the Kavadi to the Lord. 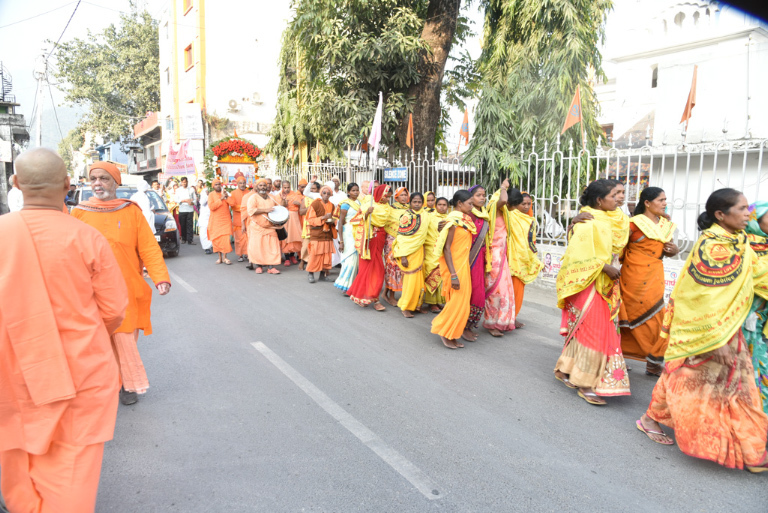 Some keen devotees undertake to walk barefoot from home to one of the shrines of Lord Subramanya, bearing the Kavadi all the way and collecting materials for the offering. He has to walk a hundred miles sometimes! The people who place the articles in the baskets also receive the Lord’s blessings. The Kavadi-bearer: The Kavadi-bearer is required to observe various rules between the time he takes up the Kavadi, and the day of the offering. He has to perform elaborate ceremonies at the time of assuming the Kavadi, and at the time of offering it to the Lord. He also puts on the dress of a Pandaram, a Saivite mendicant. It consists of a saffron-coloured cloth, a conical scarlet cap, and a cane silver-capped at both ends. Lord Siva, the Supreme Pandaram Himself, loves to wear this dress. The Pandaram lives on alms only. The bare chest of the Kavadi-bearer is covered with several rudraksha malas. The Kavadi-bearer observes strict celibacy. Only pure, Sattwic food is taken; he abstains from all sorts of intoxicating drinks and drugs. He thinks of God all the time. Many of the Kavadi-bearers, especially those who do it as a spiritual Sadhana, impose various forms of self-torture. Some pass a sharp little spear through their tongue, which is made to protrude out of the mouth. Others may pass a spear through the cheek. This sort of piercing is done in other parts of the body also. The bearer does not shave; he grows a beard. He eats only once a day. The spear pierced through his tongue or cheek reminds him of the Lord constantly. It also prevents him from speaking. It gives him great power of endurance. The Kavadi-bearer enjoys a high state of religious fervour. He dances in ecstasy. His very appearance is awe-inspiring; there is divine radiance on his face. 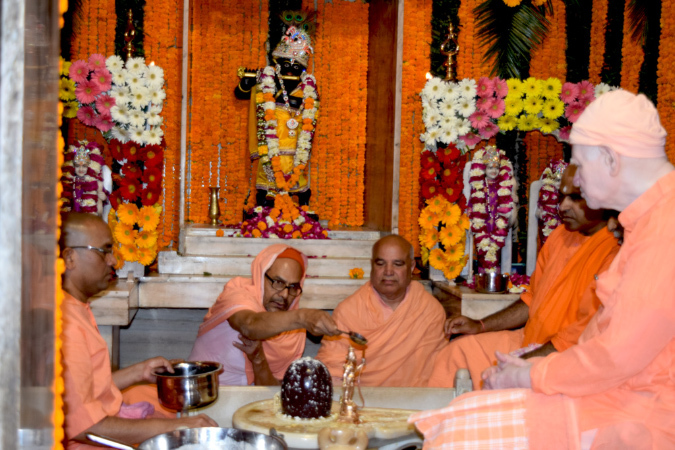 Devotees often experience the state of feeling union with the Lord. Sometimes the Deity enters them and possesses them for some time. Agni Kavadi: This is the most difficult Kavadi-offering. With the Kavadi hanging on his shoulder, the devotee walks through a pit of burning coals. Hymns are sung in praise of the Lord by those assembled all around the pit. Drums are beaten and incense is burnt. The entire atmosphere is awe-inspiring. The true devotee enters into ecstasy and easily walks over the fire. 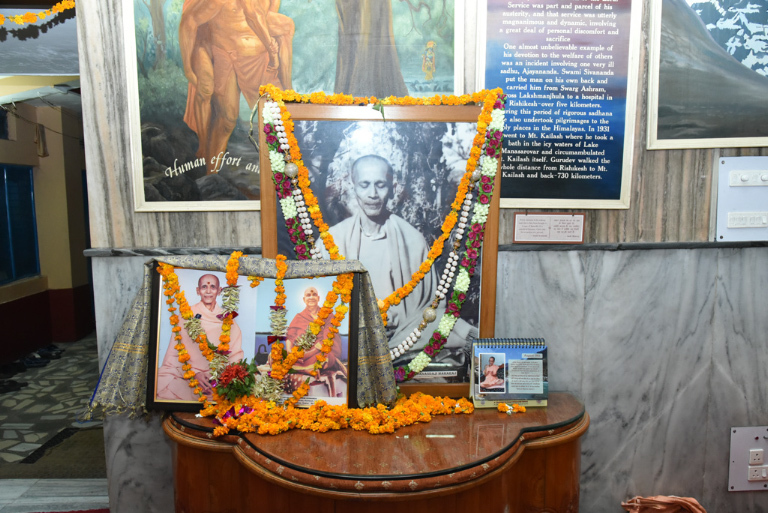 At the Sivananda Ashram in India, Skanda Sashti is observed for six days, preceding and including the Sashti day. 1. 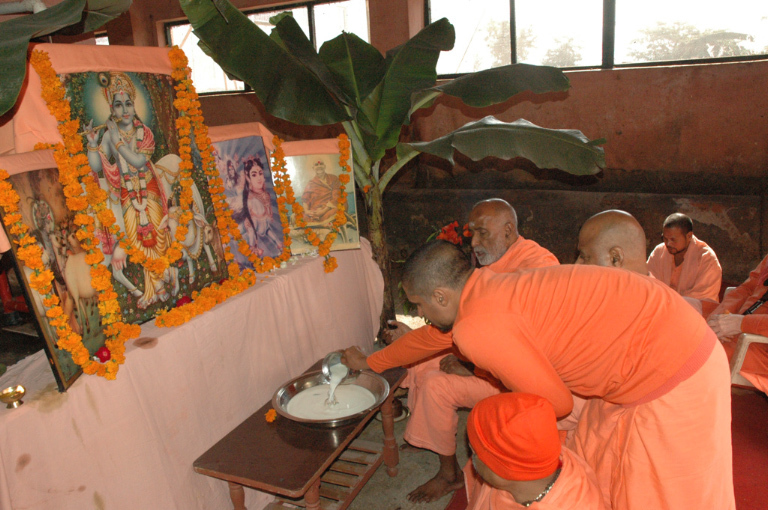 Devotees of Lord Subramanya live on milk and fruit and do rigorous Sadhana. 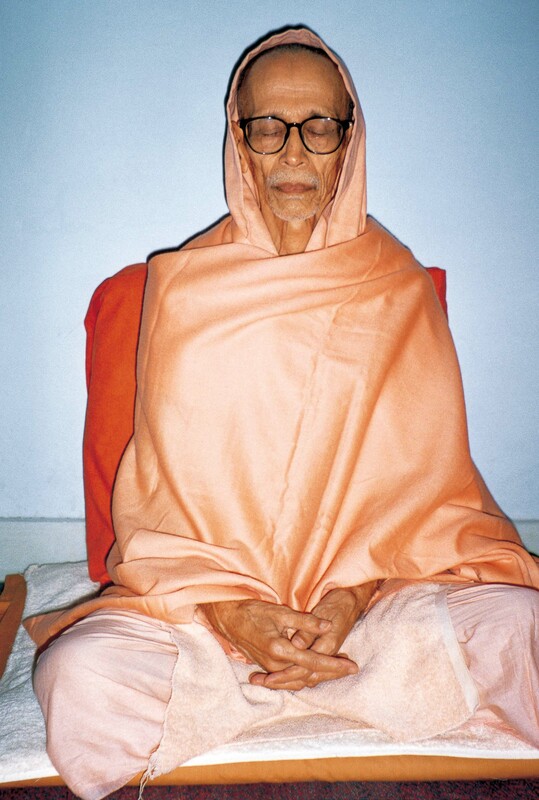 All spiritual aspirants get up at 4am during Brahmamuhurta and meditate on the Lord. 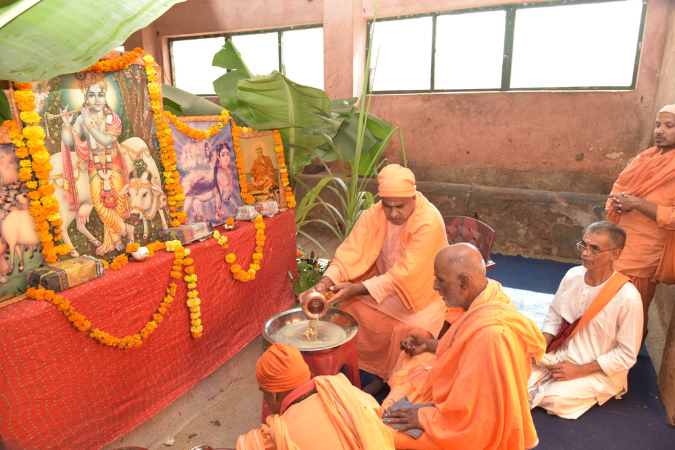 On each of the six days, all the participants do as many malas of the Mantra Om Saravanabhavaya Namah as possible. They even greet one another with this Mantra. Yogis and learned scholars deliver lectures on Subramanya Tattwa or the divine sport of the Lord. 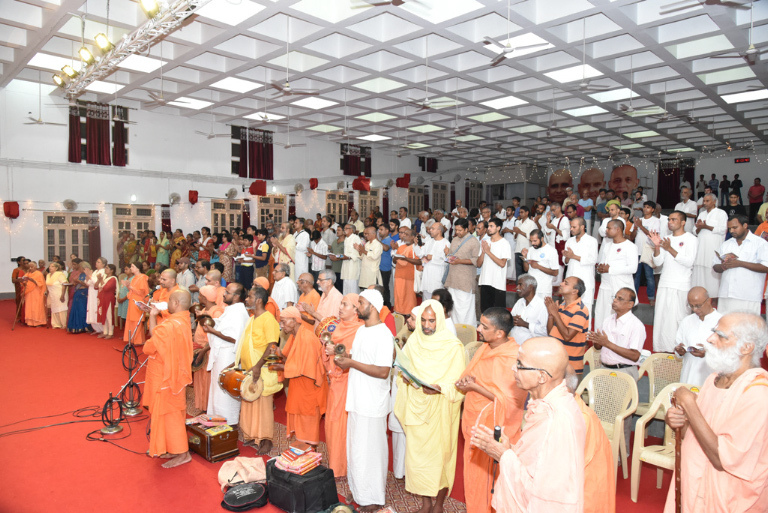 During the evening Satsang, hymns in praise of Lord Subramanya are sung. Readings are taken from my book Lord Shanmukha and His Worship. 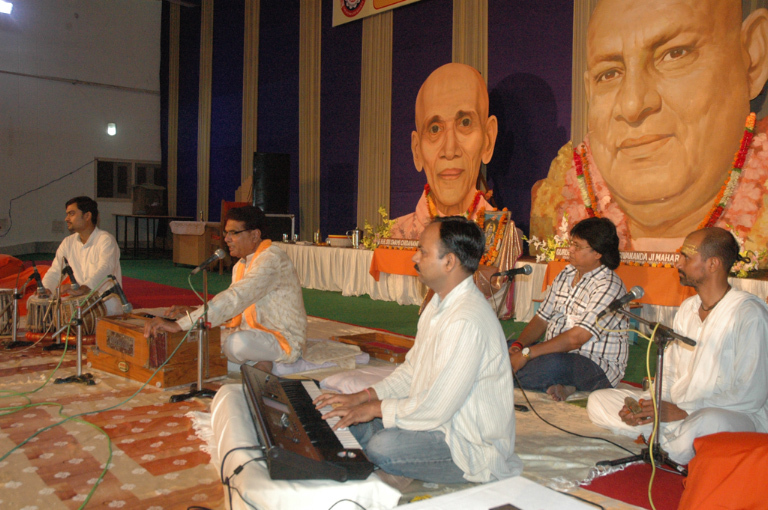 Devotees sing inspiring songs on the Lord. 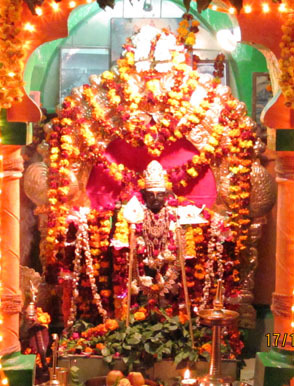 Every day there is elaborate ceremonial worship of the image of Lord Subramanya installed in the Bhajan Hall. On the last day a grand havan (fire-worship) is conducted. 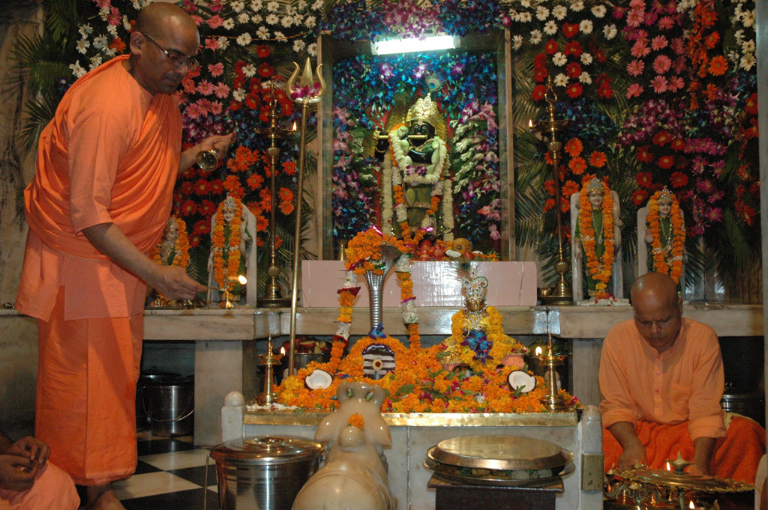 The Satsang is devoted entirely to the adoration of Lord Subramanya. Pray from the bottom of your heart: “O my Lord Subramanya, O all-merciful Lord! we have neither faith nor devotion. We do not know how to worship Thee in the proper manner, or to meditate on Thee. We are Thy child who have lost the way, forgotten the goal and Thy Name. May Lord Subramanya shower His Grace upon you!